Little bites of heaven! A great vegetarian appetizer made from tender vine leaves wrapped into little rolls and stuffed with rice and fresh herbs. This is an authentic Greek dolmades recipe for you to recreate this delicious traditional delight from scratch. These extra juicy stuffed dolmades, often served as part of a meze platter, are the ultimate bite-sized appetizer and my personal favorite! Dolmades (stuffed vine/ grape leaves) often come canned, but nothing compares to homemade dolmades, which are far superior in quality and taste and really easy to make with this detailed step by step recipe. Check out the prep photos below as well! Dolmades ( Dolmathes ) refers to Greek dishes made with either cabbage or vine/ grape leaves, stuffed with a delicious herb-y rice mix, shaped into little rolls and boiled until wonderfully tender. Some dolmades recipe variations besides rice, herbs and seasonings also include minced meat (beef and/or pork). The most popular meat dolmades variation are the Lahanodolmades (Greek cabbage rolls), which are best suited as a main course. Meat dolmades are served warm and usually garnished with egg lemon sauce (Avgolemono), while meatless vegetarian dolmades are served cold or at room temperature with a last minute squeeze of lemon juice and some thick creamy yogurt. And did I mention that they are the perfect recipe for lent! These Greek dolmades recipe may take little bit of time to prepare (mainly to roll) but they are absolutely worth every minute of preparation! To make this traditional Greek dolmades recipe (stuffed vine/ grape leaves), start by preparing the vine leaves. For this dolmades recipe, you can either use vine leaves sold in jars or fresh (if you are lucky enough to find them). If you use the ones in jar, rinse the vine leaves, remove the stems and leave them in a colander to drain. If using fresh vine leaves, wash them thoroughly, remove the stems and blanch them in boiling hot water. Remove the leaves with a slotted spoon and place them in a colander to cool down completely. Prepare the filling for the stuffed vine/ grape leaves (dolmades). Place the rice in a colander and rinse with running water. Heat a large saucepan over medium heat, add 1/3 of the olive oil and the chopped onions. Sauté the onions, until translucent (but not coloured). Add the rice and sauté for 1 more minute. Pour in 2 cups of warm water and half lemon juice and simmer for about 7 minutes, until the rice absorbs all the water and is parboiled. Season with salt and pepper, stir in the herbs, remove from the stove and set aside to cool down for a while. This will be the filling for the dolmades. Layer the bottom of a large pot with some vine leaves (use the ones that are little bit torn) and start rolling the dolmades. (This is probably the most difficult part of the traditional dolmades recipe). Place one vine leaf (shiny side down) on a flat surface and add 1 tsp of the filling at the bottom end (stem). Be careful not to overfill the dolmades, as the rice will expand during cooking. Fold the lower section of the leaf over the filling towards the center; bring the two sides in towards the center and roll them up tightly. Place the stuffed vine leaves (fold side down) on the bottom of the pot and top in snugly layers. Be careful not to leave any gaps between the dolmades to prevent them from cracking open when cooking. Drizzle the stuffed vine leaves (dolmades) with the rest of the olive oil and lemon juice and season with salt and pepper. Place an inverted plate on top to hold them down when cooking and pour in enough water just to cover them. Place the lid on and simmer the dolmades for about 30-40 minutes, until the water has been absorbed and the dolmades remain only with the oil. Remove the pot from the heat, remove the lid and plate and let the dolmades cool for at least 30 minutes. Serve this delicious Greek appetizer cold or at room temperature with a squeeze of a lemon. 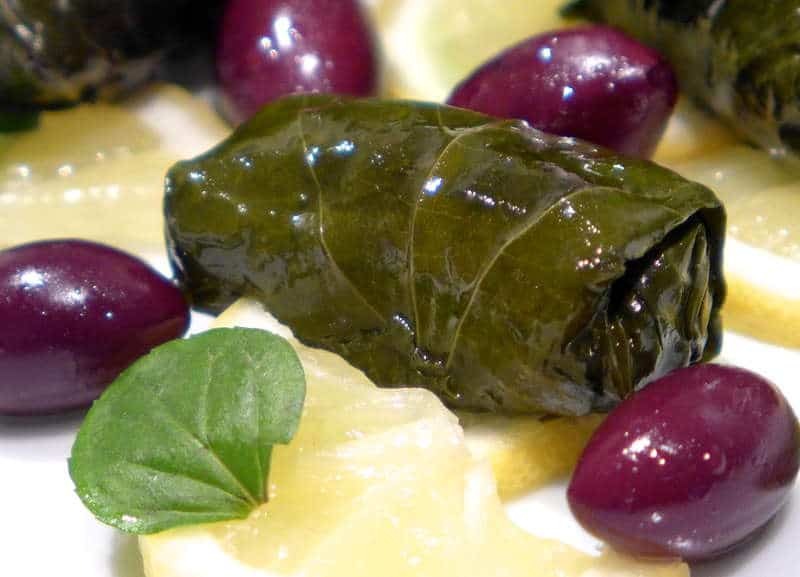 Give this traditional dolmades recipe a try and enjoy your own fresh homemade stuffed grape leaves (dolmades)! Eli! Enjoyed them immensely~~ as did all the people at the baby shower ~~ especially the mother-to-be! Thanks for the recipe. Next time I think I will make them with a bit more lemon and dill. What type of rice do you use for the dolmades please? Is the rice to be raw? Cooked in sauce pan or precooked? Way too much liquid for one cup of rice…came out mushy. Thank you for this : how to do method. very good! I made 20 last night and now its noon and they are almost finished. Excellent! Greetings from Romania, where dolmades are very popular also….heritage from greeks..
Dolma is a Turkish word, The verb is dolmak,meaning to fill. yes, but,why the big fuss about this food’s origins? In Istanbul version we add gently toasted pignoli nuts,currents,lots of fresh dill, some mint into the filling. Turkish and Greek cultures have many mutual foods, It is silly to insist on their national origin, that only creates harmful arguments, right now let us enjoy the good food. Turks were there for many centuries, I am sure they adopted many recipes from each other. let us not create more resentments between these two cultures,but learn to get along There is too much to be gained by peace.. Try the other way around. Turks invaded and returned with many Greek dishes and traditions, including food and some religious traditions (Evil Eye comes to mind). I find it amusing that invading forces always claim ownership of the invaded people’s customs. I oven bake mine in a shallow baking dish with chicken broth. Do I cook the rice first then rinse or does the rice cook during the summer?